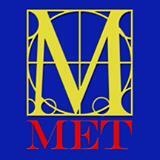 I did not get to see the show after it opened, only the first tech rehearsal. I know the show changed tremendously as all the aspects were fine-tuned and the show polished to make it performance ready. I did not want to publish something that was not valid, so it was best to not submit a review or rate the show based on an unfinished work. Still, many parts of the production were strong. From others I visited with, the show was polished, fun, and a quality production. I am sorry I missed seeing the finished product. 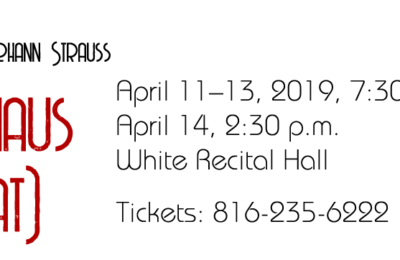 Ah, yes, just in time for some creepy fun as America’s favorite dysfunctional, ghoulish family visits the Shawnee Mission Park’s Theatre in the Park for seven performances over two weekends. “The Addams Family–The Musical,” with all the favorite characters from the 1960s TV show–Lurch, Gomez, Morticia, cousin ITT, Thing, Grandmama, Pugsley and Wednesday await the audience to perform. But, now, the two children have grown up and Wednesday has met a young man and wants to get married. The problem is she wants her parents’ approval to marry a “normal” man. So, she invites him and his family to a quaint family dinner. What could possibly go wrong? Well, this is The Addams Family, and they do differ a bit from the norm. But all is well, right? Well, not exactly. Gomez does not like the idea. Morticia frowns on the idea. Pugsley is jealous and fearful of losing his sister. Uncle Fester unveils his new love, and Grandmama’s potions and specialty herbal creations could jeopardize the nuptials. It’s all fun and games…yes, games–especially “Full Disclosure” where intimate and innermost thoughts and desires spring fourth. This is “The Addams Family–The Musical” and served as a starring role on Broadway for Nathan Lane. Big shoes to fill, but know that Brian Larios fills them well and exudes his charm and humor throughout the large outdoor facility. Larios comes to the role after doing a similar version in a small space about a year ago. He has honed his performance to make it bigger and grander for the TTIP crowd. Also paramount to the show success, Wednesday becomes a bigger character as her pending marriage and in-laws are central for the the show. 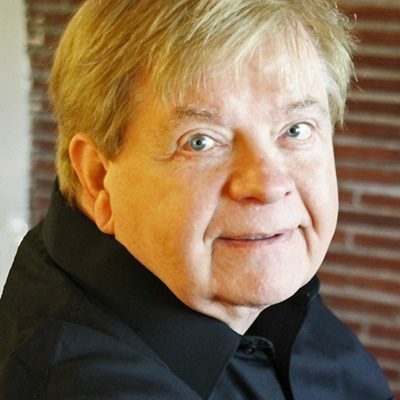 Paris Naster plays Wednesday with charm and humor. Some other strong characters that will charm the TTP crowd are Renee Blinn, as Alice, Debbie Blinn and Grandmama; and Matthew Robison as Uncle Fester. Pay close attention to the orchestra pitt as “Thing” makes his/her presence known. Watch closely at the beginning of the show for “Thing” and also as Act II begins. One of the outstanding nuances of the show is the costumes. The color scheme for this show really dictates a black and white dominance, but the subtle grays, off-whites, and drab blues really stand out. The design of the costumes is also very well done. And, along with the costumes, pay attention to John Hollan’s makeup and wigs. They help set the tone for the show and keep the audience locked-in to the darker theme of the show. For “The Addams Family” the lighting added a nice, consistent element to not overly spotlight areas of the show. The TTIP show depends a lot on the sunset each evening. The show is darker in nature, so sundown is important, and an overcast night would certainly help with the lighting and the comfort of the audience in this July heat. Choreography and movement in the show is very well planned and executed. The show does not feature heavy dance, but when the ancestors come on-stage, they move and flow well. Their entrances and exits are well planned and move well. TTIP presents a fun musical in “The Addams Family.” The show is family friendly with only a couple of utterances of adult dialogue. Certainly, the dialogue is not strong and only used rarely. Credit director Zach Faust for undertaking this production. This represents his directorial debut at Theatre in the Park. This is by far his largest undertaking for a young, up-and-coming director. Faust is building a reputation as a performer, director, and producer in the KC Metro area. His vision for “The Addams Family,” works and plays well. “The Addams Family” vision and production lay in the hands of Zach Faust as director. Faust’s production team is comprised of: Musical Director/Conductor, Adee Dancy; Accompanist, Margo Mikkelson; Choreographer, Regina Lombardo; Costume Designer, Ashley Burns; Props Designer, Abby Wolff; Hair and Make-up Designer, John Hollan; Scenic Designer, Jason Harris; Lighting Designer, Elizabeth Kennell; Sound Designer, Chase Roush; Stage Manager, Gabrielle Andrew; Asst. Stage Manager, Tyler Orbin; Asst. Stage Manager, Abby Wolff. The cast for “The Addams Family” is lead by Brian Larios as Gomez, in a part he re-reates for Theatre in the Park. He is joined by: Morticia, Juel Perry, his adoring wife; Wednesday, Paris Naster; Pugsley, Fritz Sullivan; Lucas, Ishaan Halder; Mal, Matt Walberg; Alice, Renee Blinn; Fester, Matthew Robison; Lurch, Matthew Koehler; Cousin Itt, Mia Cabrera; Grandmama, Debbie Blinn. 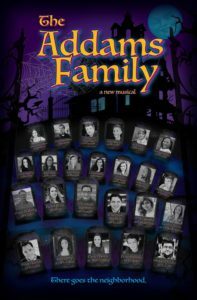 Joining in on the production as Addams ancestors are: Shantice White, Erin Cangelose, Madelyn Padget, Elisa Davis, Daniel Verschelden, Ali Watson, Lauryn Hurley, Isabel Mayer, Gavin Hoedl, Alec Walberg, Charlie Meacham, Matthew Quinn, Emma Matthieson, Robin Robles. The orchestra is: Keyboard 1- Margo Mikkelson; Keyboard 2- Sarah Hill; Reed 1- Caroline Schmidt, Liz Cruz; Reed 2- Molly Blake; Trumpet- Trent Tinker; Trombone- Ryan Devers; Violin- Neema Rafizedah, Rebecca Hill; Cello- Jessica Osborne, Madi Tozier; Bass- Benjamin Pritchard; Drums/Percussion- Joel McCoy, Will Funk. 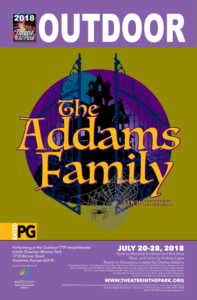 Tags: Shawnee Mission Park, Theatre in the Park, “The Addams Family”, Kansas City Theater, Kansas City Performing Arts, Kansas City Arts & Entertainment.